Most of us growing up wanted to play “guns” or “Army” … these kids are truly different. I can just hear one of them asking the other’s mother, “Can Johnny come out and play Coast Guard?” Good for them. Thanks for stopping by and have a great weekend. 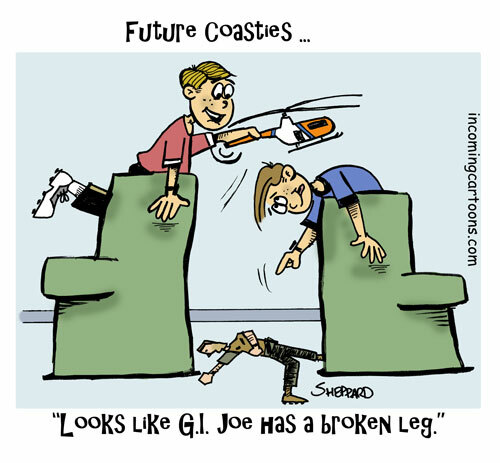 BTW … if you like the Coast Guard consider buying on of our books of USCG only cartoons. Email me at shepart@aol.com for the discount price!!!! This entry was posted on Friday, January 18th, 2019 at 12:00 am and is filed under Cartoons. You can follow any responses to this entry through the RSS 2.0 feed. You can leave a response, or trackback from your own site.